The EU will retaliate by imposing tariffs on 185 US export, according to a list already published. These measures would hurt the economy on both sides of the ocean only a little. 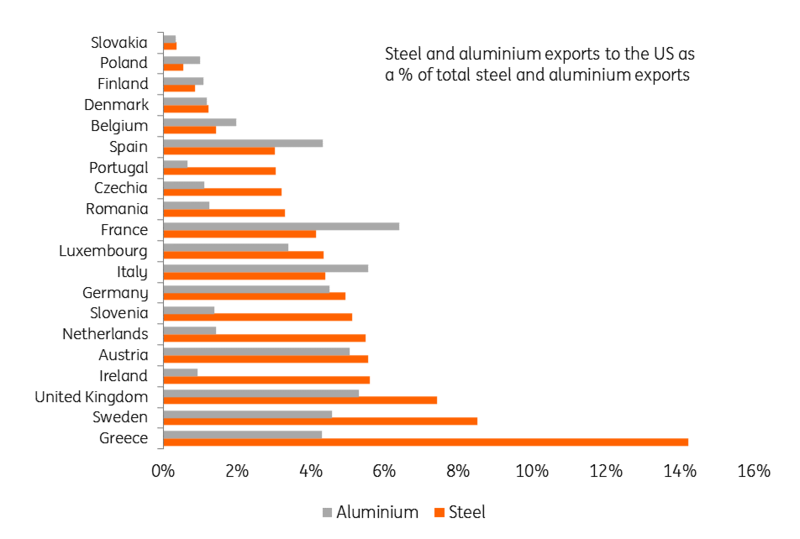 The direct impact of the steel and aluminium tariffs on the European economy are limited because exports of steel and aluminium to the US make up no more than 0.3% of worldwide goods exports by the EU and represent 0.05% of the EU's GDP. And some of that will be lost anyway due to lower US demand as prices increase due to higher tariffs. The effect of the retaliation on the US economy is negligible too. Most of the products on the list seem to be politically motivated because they target the constituency of important American politicians. For example, bourbon comes from Kentucky which is the home state of senator Mike McConnell. The total value of products charged with the tax is small: $2.8 bn which represents only 0.1% of US exports worldwide. Nevertheless, the targeted industries will feel the pain. For the EU the damage will be concentrated in steel and aluminium industries. The exact effect will depend on US price sensitivity for EU steel and aluminium. That depends on the homogeneity of the EU steel and aluminium. In other words: can it easily be substituted by steel and aluminium from domestic US suppliers or by foreign suppliers that aren’t subject to higher tariffs? To our knowledge, this type of information is unavailable at such a disaggregated product level. But the damage will be contained because 88% of EU exports of steel have other destinations than the US. On the national level, steel industries in Sweden, UK and Greece have the most exposure to the US, but the German, Italian and Dutch exposure are the largest in absolute value (see Fig. 1). For aluminium, the French, Italian, Austrian and UK industries stand out as prime victims of the US tariffs. 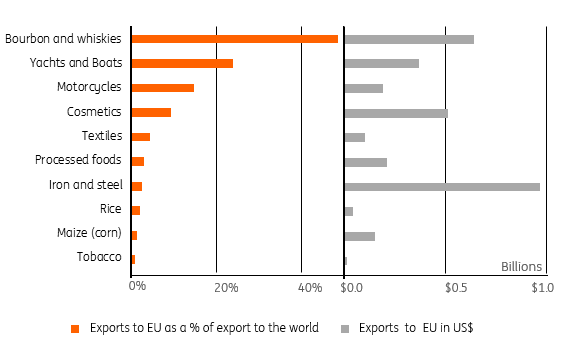 But also for aluminium holds that the lion’s share of EU exports goes to other countries than the US. France is most dependant on American demand with around 6% of its aluminium exports going to the US. In the US, the damage can be aggregated into ten groups. The figure below shows that as a share of total exports, the largest negative influence will be on the bourbon and whiskey industry, followed by yachts and boats and then motorcycles. Cosmetics and iron and steel industries will also be hurt significantly if we look at the nominal values that would be exposed to EU tariffs. But, because the share of their exports to the EU is not so large, these sector will suffer less, when looking at total export revenues. President Trump has already said that a tariff of 25% would counter any retaliation by the EU on the imports of European cars. With his announcement in May, the US government will see if imports of foreign cars is at odds with national security, which makes it seem that President Trump has started preparations for the extension of the trade war. If the European auto industry were to be levied with a 25% tax, the impact on the European economy would be much more significant. In case of such a trade battle the amount of exports hit by tariffs would be five-times larger than the tariffs to be imposed on steel and aluminium. This is because the export to the US by the automotive sector, which amounted to $32 billion worth of cars in 2017, is five-time as large as European steel and aluminium exports the US. If the EU in response, retaliates again, an all-out trade war could emerge. If we assume the various tariff increases would result in an average increase of 10% on both sides of the ocean, the economic damage would be approximately 0.3% of GDP for the EU and 0.4% for the US. For the time being, the immediate trade impact won't be the most damaging for both the US and EU economies; the second rounds are likely to have a much larger and lasting impact. Since trade concerns have sparked, confidence measures for both businesses and consumers in the Eurozone have fallen. The decline has been limited so far, but the longer trade concerns carry on, the more lasting the impact on confidence will be. 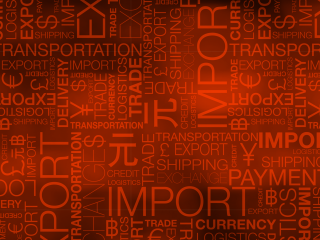 This can have a more significant impact on the economy as businesses and consumers may postpone investment and consumption, and if measures get implemented, they will still not have that large of an impact although businesses could suffer from lower profit margins as they take on some of the tariffs not to lose market share. The higher inflation due to tariffs negatively impacts real wage growth, and economic uncertainty may have broader effects on the economy. Again, the losers still outnumber the winners. The more worrying thing is the structural damage a trade war would bring to the principle of free trade. In the eyes of many, the US has already crossed the line by using national security as a justification for tariffs on steel and aluminium. But using this loophole to dodge WTO- rules for possible restrictions on the import of cars is a clear abuse of the rule-based system of international trade that the US itself has helped to build after World War II. With this abuse, the US has opened the door for other WTO members to break the rules too and Korea and Brazil have already done so. The ‘voluntary’ restraints that Korea and Brazil imposed on their steel and aluminium exports to the US are not allowed according to WTO rules. Other countries will be tempted to break the rules as well to avoid tariffs that the US threatens them with. The impact of the current talks and possible tariffs could, therefore, be far larger than the direct effects of the measures themselves.